Home / More / Library / List of Medicinal Plants / Plantago spp. COMMON NAMES: Laukahi, kuhekili [Hawai’i]; che qian zi, che qian cao (“beside-the-cart-grass”) [China]; plantain, white man’s foot [US]; breitwegerich [German]; curl doddy (P. lanceolata), healing blade (P. major) [Scotland]; llantén [Spanish]; millet [Martinique]; sat isabgol (P. ovata) [India]; slan lus (healing plant) [Gaelic]; tanchagem [Portuguese]; tha ram [Tibet]; waybread [Anglo-Saxon]. STATUS IN HAWAI’I: Worldwide there are 265 species of Plantago. In Hawai’i, three of our seven local species are endemic. However, the native ones are rare. It’s more than likely that the ones on your lawn are alien. 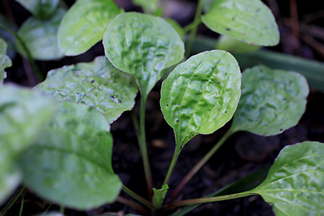 The young fresh leaves can be juiced, used in salads, or steamed. However, while plantain is often described as “edible”… that might depend on what one is willing to eat. Combined with pigweed, mustard, dock and nettle and used as mixed greens [Mohegan]. 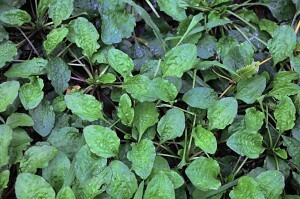 Leaves cooked and eaten as greens [Cherokee]. Used as a coagulating enzyme (rennet) to make cheese. RANGE: Native to Europe and Asia, but globally pandemic. CAUTIONS AND CONTRAINDICATIONS: Not in pregnancy.The pollen may trigger allergies.Psyllium seed powder can trigger asthma attacks if inhaled. ENERGETIC CAUTIONS: Caution in severe Qi deficiency. In the Lacnunga (an old Saxon herbal) “weybroed” (plantain) is said to be one of the nine sacred herbs of the Saxons. Legend has it that plantain was once a young woman who spent so much time by the roadside waiting for her lover that she was eventually transformed into a plant.